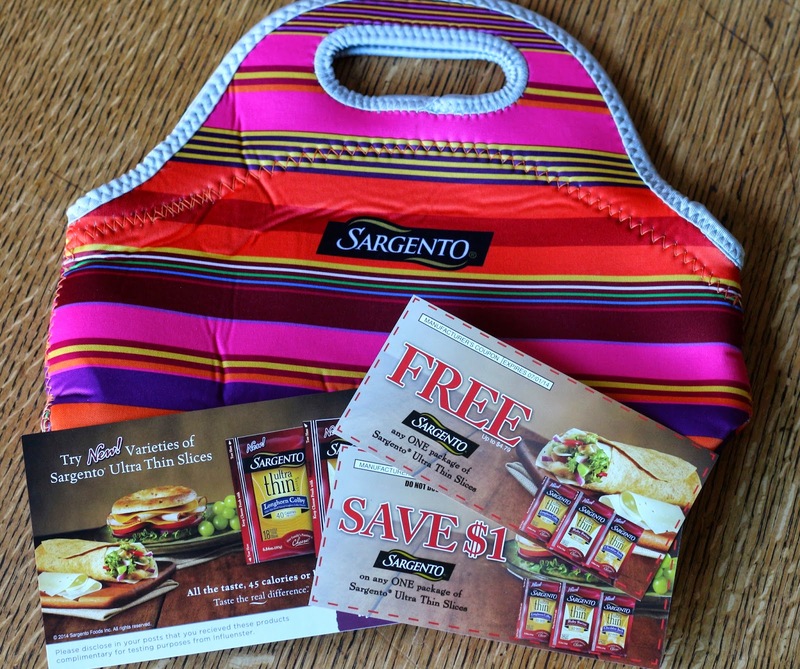 This Sargento Influenster Voxbox review took me forever to do, mostly because I was going to take photos of the cheese I got with the coupons they sent, but that just never happened. So I'll just review them without the photo! I was selected to receive the Sargento Influenster Voxbox, which if you don't know what any of that means, let me fill you in. Influenster is a site where you can review products, companies, and services and then be selected to receive Voxboxes which are basically boxes of free items sent to you to review on your social networks. 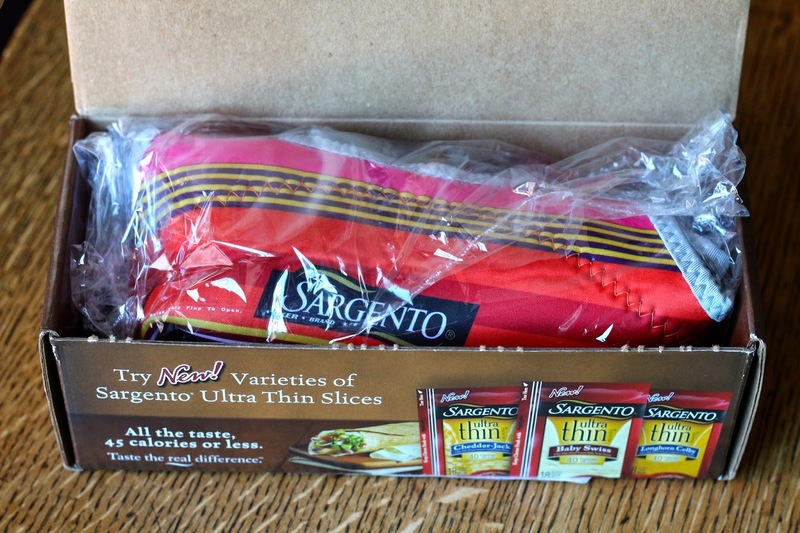 I received the Sargento Voxbox, which only included 3 things total: a lunch bag, and two coupons for Sargento Ultra Thin Slices. Here was the first look at the box, and I peeked on Instagram, I already knew what would be in here. Here is the lunch bag and the coupons. The lunch bag was very nicely made out of neoprene, and there were a few different designs people received. Ultimately, I liked the designI received, but since I work from home I probably won't be using it for a while. Maybe B and I can go on a picnic and try it out. But it's actually fairly large, and there is a large bottom sewn into it, so you can definitely fit almost any food item in here. The coupons were for one free pack of Sargento Ultra Thin Slices of cheese of your choosing, and one coupon was $1 off another pack. I have always loved Sargento cheese, I think that and Tillamook are my favorites, so I knew I would like this Ultra Thin cheese. And I think I've even bought these before receiving this box, so we do like them. I tried Pepper Jack and Cheddar, and I made grilled cheese sandwiches with them! We have this George Forman grill which we don't use for anything really, but I've found it's perfect for grilled cheese. I usually make the sandwich with a few slices of the Sargento Ultra Thin cheese, maybe one other cheese kind, some sriracha, garlic powder, and maybe ham if we have it, between two slices of sourdough bread. Butter the George Forman grill while it's warming up, place the sandwich on it, and add more butter to the grill as needed. This is the perfect cheese for a grilled cheese, because it's so thin you can use a few slices or only one, it melts really easily, and quickly, and glues the sandwich together really well. I'll definitely be purchasing Sargento Ultra Thin cheese slices again, and I hope I get to try the rest of the kinds they have available! Disclosure: I received these items complimentary for review purposes. This is my honest review.